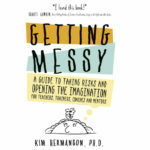 Getting Messy at East West Books, Mountain View, CA Friday June 1st 7:30 pm! God is unknowable. All we have is metaphor.